Your sink or toilet is connected to a wastewater treatment plant or underground septic system. 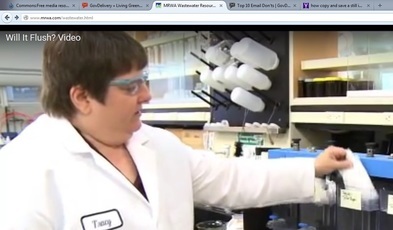 Treatment plants are really good at removing age-old stuff like human waste. But they have a much harder time removing some chemicals and products of modern life. As a result, these pollutants end up in our rivers, lakes, and streams and can end up in our drinking water. Keep them out of the sink and toilet by disposing of them safely and choosing non-toxic alternatives! Looking for ways to reduce chemicals in the home or better manage the ones that you have? 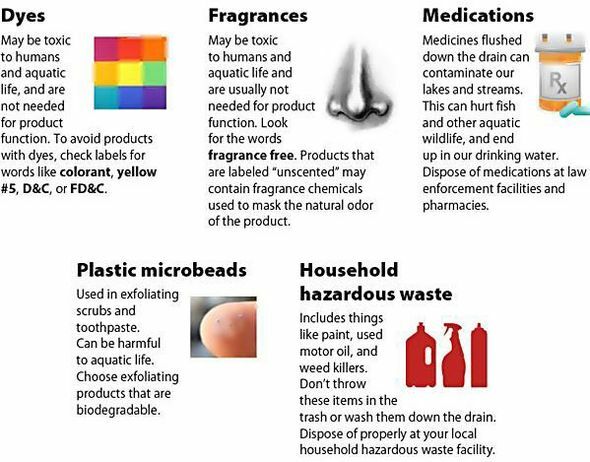 The Minnesota Pollution Control Agency (MPCA) 's Hazards in your Home webpage provides options for identifying, handling, disposing of, and avoiding toxic products. Managing unwanted medications, from the MPCA , provides information on what, why, how, and where to safely dispose of medications. At the request of the Minnesota Legislature, the MPCA looked into the issue of microbeads. What they found is contained in a report available at the MPCA's website. Two recent studies released by the MPCA confirm that a wide variety of unregulated chemicals are ending up in Minnesota’s lakes and rivers. The chemicals, including pharmaceuticals and personal care products, are of concern because many have properties that can interfere with the functioning of hormones in animals and people. You might see products like wet wipes marketed as "flushable." Don't do it! Stuff doesn't disappear when it goes down the drain. Wipes, tampons, and cat litter--even those labeled as "flushable"--clog up pipes and filters. These clogs are expensive to fix, and if they're not caught in time, they can cause sewage backups or ruptured pipes. In 2013, workers removed a big, stinky glob the size of a double-decker bus from a London sewer. The 15-ton glob was made up of wet wipes stuck together with congealed fat and other waste. It damaged a large sewer line, and took weeks to fix, at a cost of hundreds of thousands of dollars. Remember: If it's not toilet paper and it didn't come from your body, don't flush it! Check out Spokane, Washington's very cool and informative video comparing wipes, toilet paper, and other products, and what happens to them in the "flushing" process. MRES Renewable Energy Tour. The Minnesota Renewable Energy Society is holding its annual Renewable Energy Tour on Saturday, October 3, from 10am-3pm. The self-guided event is free and open to the public, and includes 50 homes, businesses and farms throughout Minnesota with renewable energy systems and sustainable practices. A list of sites is available on the MRES website. Broken stuff? Don't trash it -- Fix-it! This fall, both Ramsey and Hennepin Counties are holding Fix-it Clinics for the public in a variety of locations. Residents of both counties can bring in small household appliances, clothing, electronics, and more to receive guided assistance from volunteers with repair skills. Hennepin County Fix-it Clinic locations include: St. Anthony Village City Hall and Community Center (October 10), Folwell Park Rec Center in Minneapolis (November 14), and Maple Grove Community Center (December 12). All clinics are from noon-4pm. Clinics will be held in Ramsey County on the following Saturdays: October 31 (Roseville Library), November 21 (White Bear Lake Library), and December 19 (Mounds View Library).